Skiing to the North Pole does not involve skiing only, North Pole skiers also have to swim across leads, crawl across thin ice and climb over pressure ridges. 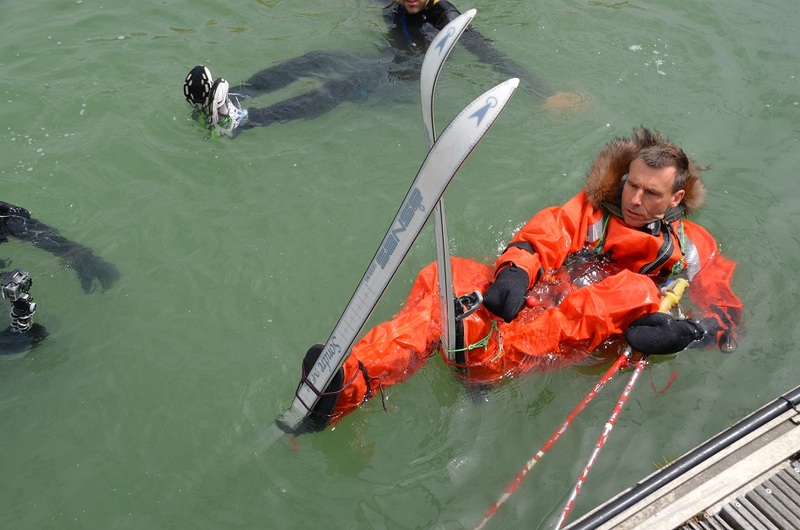 Last year, Belgian polar explorer and guide, Dixie Dansercoer, wrote a series about drysuits, used on thin ice and when swimming leads (open water) on the Arctic Ocean. Last month he checked in, telling about his expedition plans this year, we asked him about North Pole gear and South Pole kiting. Pythom/Exweb: The North Pole season is here again. Last year we posted your drysuit articles. What are your 5 favorite items in your North Pole gear list? 4: A combined shovel for organizing camp that we have given a longer shaft to allow comfortable paddling while crossing leads. At the opposite side of the paddle it has incorporated a hook that can be used to dig in the snowbank where you want to jump on solid ice. 5: The customized walking poles with the leg parts of a regular climbing harness used as wide wrist loops for easy in and out with big gloves and they are easily adaptable in size as well. 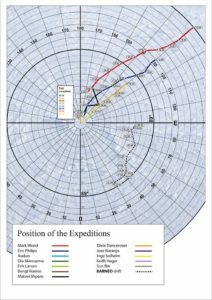 Pythom/Exweb: You had done kiting expeditions on Antarctica. Johanna Davidsson, who had kited back from the Pole after her record-breaking ski to the Pole, said kiting needs courage. We have seen kiter’s sleds broken, sleds falling with high speeds on skiers, broken skis, equipment and bodies taking hammerings. What makes it so dangerous and challenging there? What types of kites are good to use? How important is the length of the kite lines? Will 25-meter lines get you anywhere? Dixie: Antarctica is a totally different game when you do the long haul kiting expeditions in the heart of this mega-frozen-blob of ice. Sastrugi will keep you on your toes and as soon as the wind start whipping, ski-kiting becomes a stressful activity. All of your gear is subjected to constant vibration in the sled and your body has to navigate all of the obstacles that can go from small to mega sastrugi. During our 2011-12 attempt to do a ski-kite circumnavigation of more than 5000 km, Sam Deltour and I also discovered that ski-kite expeditions must gear up for no to very little wind. That means much longer lines (100 m) and kite sizes up to 18 square meters. Sam and I still had 50 square meter kites for low wind conditions, but nowadays, kites have become true long-stretched fine wings that have become so much more efficient. Currently Dixie is on Greenland with a group. 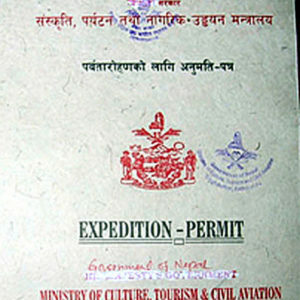 Other trips planned are Switserland, Spitsbergen, Last Degree North Pole and Iceland.